Ichiyō Higuchi (樋口 一葉) was a very important writer of the Meiji period and Japan’s first modern female writer. 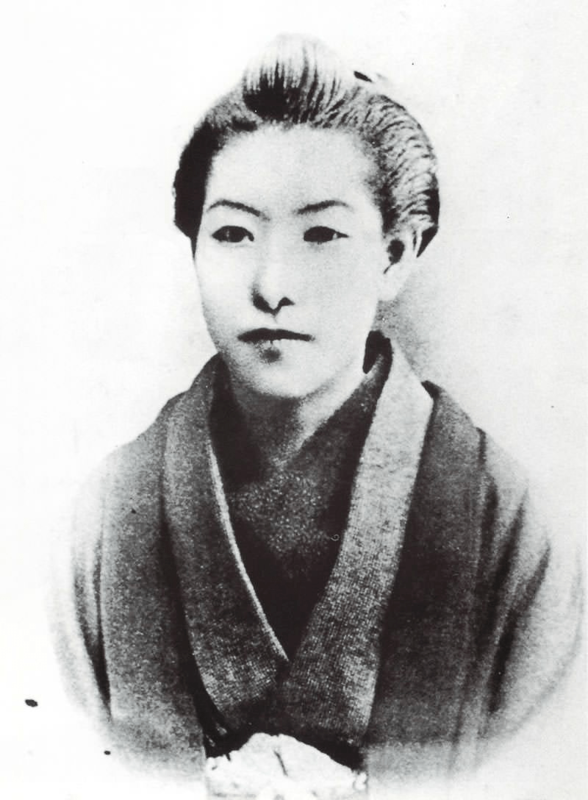 She left a legacy of classical poetry, short stories, and a detailed, 60-volume diary of her short life; her diary was written with Heian court writings of Murasaki Shikibu and Sei Shōnagon in mind, even using “the same honorific and inflected forms and the same indirection to be found in The Tale of Genji”(p.62). In the Shade of Spring Leaves covers nine of Higuchi’s short stories, but the first half of the book is about her life and times as well as some excerpts from her diary, which I have not been able to find translated into English otherwise. This biography section of this edition is one of the most engaging and engrossing author biographies I’ve ever read. It gives clues as to why Higuchi’s diary was popular enough for a public reading. This series will also look at the Japanese language edit of her diary by scholar Yoshie Wada a little bit. Danly’s depiction of Higuchi in this portion of the book is quite vivid and lively, matching somewhat the literary tone of her diary excerpts. Ichiyō Higuchi was born in 1872 and died in 1896 at the young age of 24. Her parents were peasant farmers who worked their way through the levels of society to reach samurai status on the verge of the Meiji Restoration when such status became meaningless. Ichiyō, born Natsuko, was the middle daughter and favorite child of the family. Her father carefully attended to her education and had great expectations of her from a young age, but her mother objected to so much “book learning” for her daughter and put an end to it when Ichiyō was 11 because she was concerned it would make her less attractive for marriage. However, Ichiyō’s brothers and sisters fared far worse than she in their fortunes, dealing with divorce, illness and sloth. Only at age 14 was Ichiyō finally allowed to attend poetry school as a concession. This period of her life marks the start of her famous diary. Days of study at the library, writing, consultations with her mentor, and her poetry class are later mingled with vignettes of Higuchi’s life with her widowed mother Taki and younger sister Kuniko. Then we meet Higuchi’s mentor and “love of her life,” the tarnished knight in shining armor, serial writer and widower Tōsui Nakarai. Danly flatly states that Narakai was unsuitable for her as a mentor, but Higuchi ignored those kinds of considerations in her infatuation with Narakai. However, perhaps history has proven her choice to be the correct one, at least from the perspective of emotion and inspiration. Certainly he affected her positively on a human level. Professionally, even if he wasn’t good for her literary career, he had a gentle touch criticizing her work which she took well, and he was a good friend to her and her family in spite of all of his flaws and family problems. Unsubstantiated gossip ultimately tore their friendship apart, but to her credit Higuchi did keep in mind how much he had done for her. He ultimately arranged for her to work with a new mentor, Kōyō Ozaki. Higuchi picked the pen name “Ichiyō” in 1891. Literally meaning “one leaf,” it is a reference to the reed boat in which the Buddha crossed the Yangtse River in 6th century China with deeper references to a specific form of Zen meditation (Danly, p. 51). According to tradition, once she picked a literary style name, she was known as Ichiyō and not Natsuko. At that point, her goal of publishing her work was realized, and her first story “Flowers at Dusk” was published by Tōsui Narakai in his short-lived magazine. From there, her writing career took off, but her family’s poverty was such that the Higuchis were forced to move and become shopkeepers even with her writing income; again here the example of Narakai was a guide for Ichiyō in doing what she had to do for her family’s survival. When a rival shop opened and caused business to go bad, she had at hand a number of other schemes to try to raise their fortunes. These missteps actually turned into opportunity since it brought her into contact with her greatest inspiration, the Yoshiwara pleasure district. Danly spends a fair amount of time analyzing her early stories that were published in increasingly prestigious magazines, including ones that are not included in this collection. These extra stories we won’t be reading for this series include “Umoregi” (In Obscurity), “Hanagomori” (Clouds in Springtime), “Ōtsugomori” (On the Last Day of the Year), “Nigorie” (Troubled Waters, September 1895), for example. This biography section also looks at the changes brought by the Meiji Restoration as well as the shifting literary winds, which created a clash between commercial and literary writing, Edo popular writing and European-inspired realism. Higuchi’s work and its place in the larger context of Japanese popular writers of both stripes is also examined in detail. Next time, we will look at some of this commentary in relation to the specific stories Danly has selected to highlight. Part one of a four part series. Lady Xiansa is a writer, linguist, artist, and dancer. She has been a core volunteer for the Silk Screen Asian Arts Organization from 2007 to 2018 and has provided content for Pitt JCS anime events since 2011. She has taught both ESL and Beginning Korean. Her gothic horror novel, The Haunting at Ice Pine Peak, won the Bronze Award for Young Adult Fiction E-book in the 2016 Moonbeam Children's Book Awards and earned the 2018 Story Monsters Approved Seal in the Tween Category. This entry was posted in Japan and tagged Anime & Manga, Buddhism, Japanese History, Traditional Japanese Literature, Translation, Westernization. Bookmark the permalink.